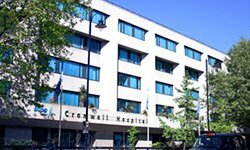 The Bupa Cromwell Hospital is a purpose-built 120 bed private hospital, which opened in 1981. There are more than 400 consultants working at Bupa Cromwell Hospital, making it one of the largest private hospitals in the UK. The hospital offers the highest standards of care, including a wide range of advanced diagnostic technology which is vital in the assessment of people with foot and ankle problems. The hospital is approximately a five minute walk from Earls Court, High St Kensington and Gloucester Road tube stations. It is also on the number 74 bus route.